This article is about the class of proteins. For the substance sometimes called albumen, see egg white. For the specific albumins found in vertebrate bloodstreams, see serum albumin. For other uses, see Albumin (disambiguation). The albumins (/ˈælbjʊmɪn/; formed from Latin: albumen "(egg) white; dried egg white") are a family of globular proteins, the most common of which are the serum albumins. All the proteins of the albumin family are water-soluble, moderately soluble in concentrated salt solutions, and experience heat denaturation. Albumins are commonly found in blood plasma and differ from other blood proteins in that they are not glycosylated. Substances containing albumins, such as egg white, are called albuminoids. A number of blood transport proteins are evolutionarily related, including serum albumin, alpha-fetoprotein, vitamin D-binding protein and afamin. Albumin binds to the cell surface receptor albondin. Serum albumin is the main protein of human blood plasma. It binds water, cations (such as Ca2+, Na+ and K+), fatty acids, hormones, bilirubin, thyroxine (T4) and pharmaceuticals (including barbiturates): its main function is to regulate the oncotic pressure of blood. Alpha-fetoprotein (alpha-fetoglobulin) is a fetal plasma protein that binds various cations, fatty acids and bilirubin. Vitamin D-binding protein binds to vitamin D and its metabolites, as well as to fatty acids. The isoelectric point of albumin is 4.9. 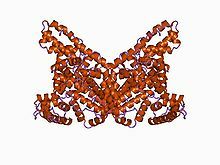 The 3D structure of human serum albumin has been determined by X-ray crystallography to a resolution of 2.5 ångströms (250 pm). Albumin is a 65–70 kDa protein. Serum albumin is the most abundant blood plasma protein and is produced in the liver and forms a large proportion of all plasma protein. The human version is human serum albumin, and it normally constitutes about 50% of human plasma protein. Serum albumins are important in regulating blood volume by maintaining the oncotic pressure (also known as colloid osmotic pressure) of the blood compartment. They also serve as carriers for molecules of low water solubility this way isolating their hydrophobic nature, including lipid-soluble hormones, bile salts, unconjugated bilirubin, free fatty acids (apoprotein), calcium, ions (transferrin), and some drugs like warfarin, phenobutazone, clofibrate & phenytoin. For this reason, it is sometimes referred as a molecular "taxi". Competition between drugs for albumin binding sites may cause drug interaction by increasing the free fraction of one of the drugs, thereby affecting potency. bovine serum albumin (cattle serum albumin) or BSA, often used in medical and molecular biology labs. The normal range of human serum albumin in adults (> 3 y.o.) is 3.5 to 5 g/dL. For children less than three years of age, the normal range is broader, 2.9–5.5 g/dL. Low albumin (hypoalbuminemia) may be caused by liver disease, nephrotic syndrome, burns, protein-losing enteropathy, malabsorption, malnutrition, late pregnancy, artefact, genetic variations and malignancy. High albumin (hyperalbuminemia) is almost always caused by dehydration. In some cases of retinol (Vitamin A) deficiency, the albumin level can be elevated to high-normal values (e.g., 4.9 g/dL). This is because retinol causes cells to swell with water (this is also the reason too much Vitamin A is toxic). This swelling also likely occurs during treatment with 13-cis retinoic acid (isotretnoin), a pharmaceutical for treating severe acne, amongst other conditions. In lab experiments it has been shown that all-trans retinoic acid down regulates human albumin production. Other albumin types include the storage protein ovalbumin in egg white, and different storage albumins in the seeds of some plants, including hemp. Note that the protein "albumin" is spelled with an "i", while "albumen" with an "e", is the white of an egg, which contains (among other things) several dozen types of albumin (with an "i"), mostly ovalbumin. In acoustic droplet vaporization (ADV), albumin is sometimes used as a surfactant. ADV has been proposed as a cancer treatment by means of occlusion therapy. Human serum albumin may be used to potentially reverse drug/chemical toxicity by binding to free drug/agent. Worldwide, certain traditional Chinese medicines contain wild bear bile, banned under CITES legislation. Dip sticks, similar to common pregnancy tests, have been developed to detect the presence of bear albumin in traditional medicine products, indicating that bear bile had been used in their creation. ^ Sugio, S.; Kashima, A.; Mochizuki, S.; Noda, M.; Kobayashi, K. (1 June 1999). "Crystal structure of human serum albumin at 2.5 A resolution". Protein Engineering Design and Selection. 12 (6): 439–446. doi:10.1093/protein/12.6.439. PMID 10388840. ^ a b c He, Xiao Min; Carter, Daniel C. (16 July 1992). "Atomic structure and chemistry of human serum albumin". Nature. 358 (6383): 209–215. doi:10.1038/358209a0. PMID 1630489. ^ Pliny The Elder. Historia Naturalis 28, 6, 18. ^ Haefliger, Denise Nardelli; Moskaitis, John E.; Schoenberg, Daniel R.; Wahli, Walter (October 1989). "Amphibian albumins as members of the albumin, alpha-fetoprotein, vitamin D-binding protein multigene family". Journal of Molecular Evolution. 29 (4): 344–354. doi:10.1007/BF02103621. PMID 2481749. ^ Schoentgen, Francçoise; Metz-Boutique, Marie-Hélène; Jollès, Jacqueline; Constans, Jacques; Jollès, Pierre (June 1986). "Complete amino acid sequence of human vitamin D-binding protein (group-specific component): evidence of a three-fold internal homology as in serum albumin and α-fetoprotein". Biochimica et Biophysica Acta (BBA) - Protein Structure and Molecular Enzymology. 871 (2): 189–198. doi:10.1016/0167-4838(86)90173-1. PMID 2423133. ^ Lichenstein, HS; Lyons, DE; Wurfel, MM; Johnson, DA; McGinley, MD; Leidli, JC; Trollinger, DB; Mayer, JP; Wright, SD; Zukowski, MM (8 July 1994). "Afamin is a new member of the albumin, alpha-fetoprotein, and vitamin D-binding protein gene family". The Journal of Biological Chemistry. 269 (27): 18149–54. PMID 7517938. ^ a b c Farrugia, Albert (January 2010). "Albumin Usage in Clinical Medicine: Tradition or Therapeutic?". Transfusion Medicine Reviews. 24 (1): 53–63. doi:10.1016/j.tmrv.2009.09.005. PMID 19962575. ^ Pasantes-Morales, H; Wright, CE; Gaull, GE (December 1984). "Protective effect of taurine, zinc and tocopherol on retinol-induced damage in human lymphoblastoid cells". The Journal of Nutrition. 114 (12): 2256–61. doi:10.1093/jn/114.12.2256. PMID 6502269. ^ Masaki, T; Matsuura, T; Ohkawa, K; Miyamura, T; Okazaki, I; Watanabe, T; Suzuki, T (15 July 2006). "All-trans retinoic acid down-regulates human albumin gene expression through the induction of C/EBPbeta-LIP". The Biochemical Journal. 397 (2): 345–53. doi:10.1042/BJ20051863. PMC 1513275. PMID 16608438. ^ "Hemp Repairs Damaged DNA". High Times. 28 Aug 2014. Retrieved 10 Sep 2014. ^ Roberts I, Blackhall K, Alderson P, Bunn F, Schierhout G (9 November 2011). "Human albumin solution for resuscitation and volume expansion in critically ill patients". The Cochrane Database of Systematic Reviews (11): CD001208. doi:10.1002/14651858.CD001208.pub4. PMID 22071799. ^ Lo, Andrea; Kripfgans, Oliver; Carson, Paul; Rothman, Edward; Fowlkes, J. (May 2007). "Acoustic droplet vaporization threshold: effects of pulse duration and contrast agent". IEEE Transactions on Ultrasonics, Ferroelectrics and Frequency Control. 54 (5): 933–946. doi:10.1109/tuffc.2007.339. ^ Ascenzi, Paolo; Leboffe, Loris; Toti, Daniele; Polticelli, Fabio; Trezza, Viviana (2018-04-15). "Fipronil recognition by the FA1 site of human serum albumin". Journal of Molecular Recognition. 31 (8): e2713. doi:10.1002/jmr.2713. ISSN 0952-3499. PMID 29656610. Wikisource has the text of the 1911 Encyclopædia Britannica article Albumin.